These hotel provides the choice for an all-inclusive package as well as other meal plans, such as bed & breakfast, half-board and full-board. The All inclusive packages usually include hotel accommodation, a wide range of other amenities such as unlimited food, most alcoholic drinks, some sports activities, and daily and nightly entertainment included in the price as well. So locally produced wines, beers, rum, whiskey, gin etc will be part of the All Inclusive package but not Bells Scotch whisky. Golf and Spa Treatments usually cost extra, but at least you know what you’re paying before you check in. Since these hotels cater for guests staying on range of packages, from bed & breakfast to the All Inclusive option, then, you would ask to identify yourself as a guest staying on all inclusive bases and to sign a receipt (In Mauritius, hotels do not tend to bother with wristbands that AI guests have to wear in other countries) after each meal, or after visiting the bar for a drink. Extras such as imported alcoholic drinks will count as extras and will be part of your bill. 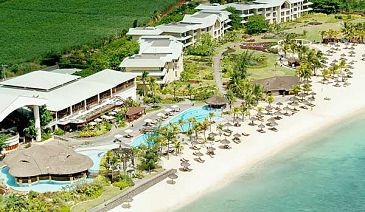 It is a 3* hotel, offering a unique and peaceful seaside holiday accommodation on charming and picturesque Mauritius East Coast. Hotel accommodation: Its 76 rooms in a very relaxing setting offering garden / pool / sea views. Ideally situated in the heart of the famous village of fisherman, Tamarin Hotel; 3* faces with the wild beach of bay bearing its name. Hotel accommodation: Its 58 colorful standard rooms (including 3 interconnecting rooms), 2 suites & 5 family villas, will surprise you with their special 70’s style. Tropical Attitude, a 3 star sup hotel, is built in the middle of a garden planted with coconut trees and right on the lagoon. The authenticity of the hotel relies on its Creole architecture and its contemporary tropical decoration. Hotel accommodation: The luminous colours of the 60 sea-facing rooms contribute to their relaxed atmosphere and are classified in 2 categories, namely: 58 Standard Beachfront rooms and 2 family rooms. 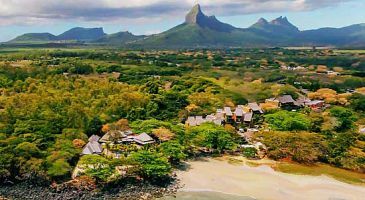 Coin de Mire Attitude, 3* hotel situated at the northern tip of Mauritius, between the fishermen’s village of Cap Malheureux and the lively village of Grand Bay, facing the most stunning view the island offers, the majestic rock Coin de Mire sitting on the horizon. Hotel accommodation: Its 102 spacious rooms and its Spa Attitude invite families, couples and individuals to relax in a very cozy atmosphere, classified in 3 categories, including 67 Superior rooms, 23 deluxe rooms and 12 Deluxe Family rooms. 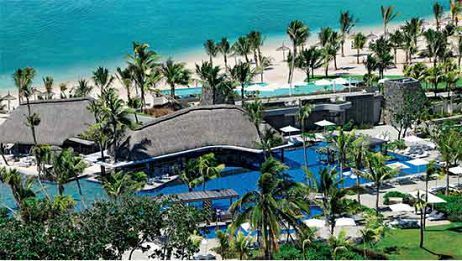 Émeraude Beach Attitude, a 3* hotel facing Mauritius most beautiful beaches; Belle Mare beach with its kilometres of white sand, turquoise and emerald lagoon running along the coast. The hotel’s innovative package “Émeraude Inclusive” (a tailored all inclusive accommodation package,) is ideal to enjoy unrestrainedly, as a couple or a family, a seaside holiday in such an exclusive spot. Hotel accommodation: Its 61 rooms are available in 2 categories including two pairs of Standard rooms connecting and one Standard room connected with one Superior room. 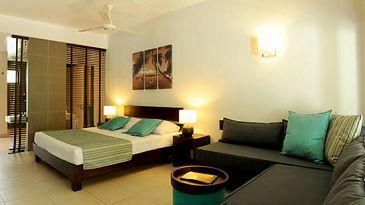 Dressed in white and wood Récif Attitude, a 3*+ hotel is a mix of comfort, vibrant Mauritian soul and boutique hotel spirit. Hotel accommodation: Its 70 rooms are well decorated with taste, offering 3 room categories, namely: 31 Standard Rooms, 29 Standard Beachfront Rooms and 10 Deluxe Beachfront Rooms. 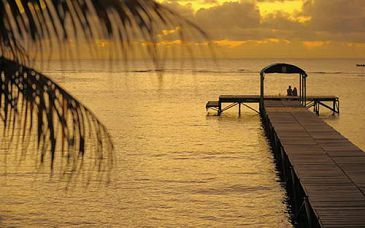 This 3*+ hotel is located in the fishermen village of Grand Gaube on the North coast of Mauritius with direct access to the beach. The decor of colonial inspiration, a subtle combination of wood, stone and thatch roofs, reveals a peaceful haven for couples seeking an unforgettable getaway to our paradise island. Hotel accommodation: its 81 rooms with furnished balcony/terrace are available in 2 categories, namely: 12 comfort rooms, 57 superior rooms and 12 Privilege rooms. This lush 3* superior beach hotel in Mauritius is an oasis of calm. Sip a cocktail lounging on your beach bed, or surrender to soulful relaxation at LUX* ME Spa. Hotel accommodation: With its vibrant colours and beautiful views over the lagoon or tropical gardens, the 169 rooms are classified in the different categories namely; 3 Deluxe Family Rooms, 35 Deluxe Rooms Bungalow, 16 Deluxe Rooms Beachfront, 45 Superior Rooms and 70 standard rooms. Centara Poste Lafayette Resort & Spa, a 4* hotel is a contemporary interpretation of the island’s architectural heritage, blending in with the lush surroundings and flanked by a pristine beach with its own sparkling lagoon to one side and a leaf-green mountain to the other. Hotel accommodation: Its 100 rooms feature a minimalist design, blending colours with fabrics that mirror the sun-filled landscapes and azure waters and are classified as follows: 18 Superior rooms, 36 Deluxe Ocean Facing rooms, Deluxe Garden Terrace rooms, 9 Deluxe Ocean Front rooms and 19 Deluxe Ocean Front Terrace. 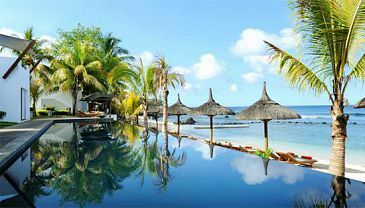 This all-inclusive, 4* hotel in Mauritius, located at Bel Ombre in the south-west of the island, is surrounded by dramatic mountains and dense sugarcane fields. Here an effervescent zest for life combines with contemporary design to bring the young (and young at heart) the perfect spot for fun and relaxation. Hotel Accommodation: Its 214 rooms in vibrant colours of the décor, match the tropical surrounds stroke by stroke are classified as follows: 68 Standard Rooms, 104 Superior Rooms, 34 Premium Rooms and 8 Deluxe Family Rooms. Preskil Beach Resort, a 4* hotel is ideally situated on a natural private peninsula along the South East coast of Mauritius, which leads to the marine park of Blue Bay and offers panoramic views over l'Ile aux Aigrettes. Hotel accommodation: Its 156 rooms lead onto a balcony or terrace and are classified as follows: 114 Lagoon rooms, 28 Prestige Cottages Rooms and 4 Deluxe Penthouses Rooms. This 4* resort is situated on the sun-drenched northern coast of Mauritius, offering cosmopolitan and relaxed, simple yet cosy atmosphere. Le Mauricia also provides an optional package called the “Beachcomber All-Inclusive” package, to allow families to relax in total peace of mind during their stay in Mauritius. Hotel accommodation: Its comprehensive range of accommodation are classified as follows: 143 Standard Rooms, 60 Superior Rooms, 28 Family Apartments, 3 Honeymoon Suites, 2 Lofts and 1 Villa. 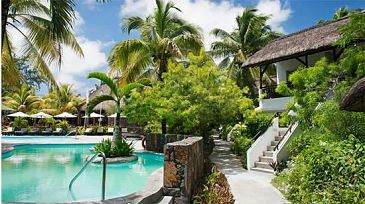 One of the best family resorts in Mauritius, Le Canonnier stands proudly above the coastline on a historic peninsula. Le Canonnier enhances the authentic Mauritian atmosphere with commanding views over the Northern islands, lush tropical gardens dotted with cascading pools and a string of secluded creeks. Hotel accommodation: Its wide range of rooms are classified as follows: 48 Standard Sea-facing, 56 Standard Garden & Pool view, 62 Superior Sea-facing, 50 Superior Garden & Pool view, 24 Family Duplex Sea-facing, 20 Family Duplex Garden & Pool view, 20 Apartments, 4 Honeymoon Suites Sea-facing. With its unique architecture, La Palmeraie, a 4* hotel offers every guest an intimacy that cannot be experience elsewhere in Mauritius. The Andalucian atmosphere combined with the Mauritian culture invites our guests to experience something new. Hotel accommodation: Each room, with romantic ivory canopy, geometrical design and intricately designed furniture combines the unique style of Morocco and Mauritius to create the perfect retreat. The rooms are divided into the following 3 categories: 28 Superior rooms (4 interconnecting rooms), 29 Deluxe Beachfront rooms (8 interconnecting rooms), 3 Junior Suites; The Honeymoon Suite, "Jasmine", with sea view and 2 Beachfront Junior Suites, "Leila" and "Pasha". 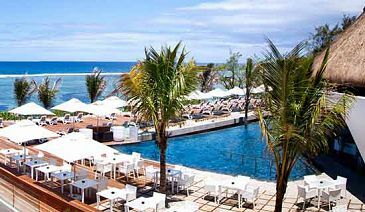 Le Méridien Ile Maurice, a 4* hotel stands at the edge of 1,000 metres of sparkling ivory sands on the North-West coast of Mauritius in the bay of Pointe Aux Piments. Lush gardens create the perfect atmosphere for a romantic idyll or a serene getaway. Hotel accommodation: Their wide ranges of rooms are classified in the following 11 categories: Deluxe Room Ocean View, Deluxe Garden & Ocean View, Premium Deluxe Ocean View, Nirvana Garden View Rooms, Premium Nirvana Mountain View Rooms, Nirvana Garden & Ocean View Rooms, Premium Nirvana Ocean View Rooms, Family Suite Ocean View, Honeymoon Suites, Duplex Family Suite and Royal Suite Ocean View. 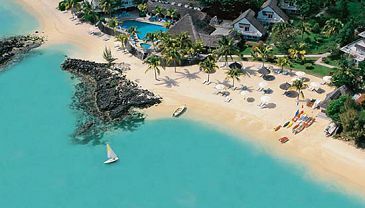 Just moments away from the quiet fishing village of Grand Gaube on the north coast of Mauritius, this 5* beach hotel set on one of the most beautiful site in Mauritius, offers you to enjoy the view from your room, suite or villa overlooking the triple-bay beaches, lagoon and spectacular north islands. Move to the rhythm of island life with local musicians and dancers at the various restaurants and bars. Hotel accommodation: Inspired by authentic island living, each of their six room types has been designed to reflect the vibrant energy and lively ambience of Mauritius and classified as follows: 22 Superior Rooms, 104 Ocean Superior, 46 Deluxe Rooms, 23 Junior Suites, 2 Senior Suites and LUX* Villa. Enjoy the elegant simplicity of Tamarina Hotel, Golf, Beach & Spa, a unique 4* boutique-hotel of 50 rooms between mountain and turquoise waters on the west coast of Mauritius. Make the most of your all inclusive golf package, relax at the spa or on the beautiful beach of Tamarina Bay. Hotel accommodation: The 50 rooms of Tamarina Hotel, Beach, Golf and Spa are just like Africa, so fascinating. Spacious, 35m2 for each, the fifty rooms offer a 4* comfort. In the room or on the terrace, surrounded by the centenary vegetation, make the most of it under the Mauritius sun! 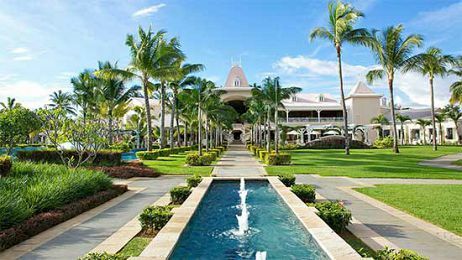 Maritim Hotel Mauritius remarkable setting, overlooking the most enchanting “Turtle Bay”, this 4*+ hotel is a perfect blend of tropical and colonial architecture which provides an elegant background for a sophisticated and yet totally relaxing vacation. Hotel accommodation: 215 elegant rooms ranging from 5 categories of rooms, namely: 97 Privilege Rooms, 75 Prestige Rooms, Suites (Theme, Elegant Junior, Romantic Honeymoon), 2 exclusive Presidential Suites and 1 Luxurious Family Villa. Facing the splendid sunsets, Le Victoria, a 4* resort is one of the most popular family resorts on the island. Hotel accommodation: All rooms are sea-facing and are classified in the following categories: 76 Superior Room First Floor, 78 Superior Room Ground Floor, 76 Deluxe Rooms, 15 Family Apartments, 6 Junior Suites, 2 Senior Suites and 1 Executive Suite. Inspired by the famous fishing boats of Mauritius from which this 4* resort takes its name, La Pirogue's unique architectural style is enhanced in its guestrooms by the added rustic warmth of wood and thatch. Hotel accommodation: The rooms are classified in 3 main categories, standard rooms, Superior rooms and Royal Suites where all guestrooms are at ground-level and open privately on the magnificent palmgrove and the Superior guestrooms are situated closer to the sea. Hotel accommodation: The romantic calling of this intimate hotel of 67 double rooms, nestled in a tropical garden with bushes of orangey and red Ixoras, multicoloured hibiscus and bougainvilleas, fragrant frangipani and flowery creepers along its pergolas, reveals itself as a haven of peace in an Indian atmosphere subtly brightened up with Mauritian exoticism, in the following 4 categories: Pondicherry Room, 1001 Nights Room, Club Junior Suite and Club Senior Suite. On the Western coast of Mauritius, Sugar Beach resort faces the turquoise waters of a paradise lagoon. This 5* hotel in Mauritius has a contemporary plantation-style architecture, reminiscent of a colonial mansion. Hotel accommodation: Each of the 258 Rooms and Suites at Sugar Beach has a private balcony or terrace equipped with a lounger, ottoman and a sofa for your comfort. The hotel rooms are classified in the following categories, namely; Standard rooms, Superior rooms and 2 comfortable Suites. The Long Beach, a new 5* luxury hotel in Mauritius nestles on the edge of one of the Island’s longest, widest and most beautiful natural beaches. Contemporary and chic, the Long Beach has been built around the concept of “Italian life”. Hotel accommodation: The hotel has 255 rooms, harmoniously arranged in three semi-circles and are classified in the following categories: 116 Standard Sea-View rooms (84 of which are connecting), 108 Superior Beach-Front rooms (56 of which are connecting), 29 Family rooms and 2 Beach-Front Deluxe Suites. A 5* hotel and luxurious private villas in Mauritius - shining with the vibrant energy and hospitality of authentic island life. Enjoy the view of pristine white beaches and a sparkling lagoon from your traditionally thatched villa or suite at this exceptional hotel in Mauritius. Hotel accommodation: Equipped with the handcrafted LUX* Sleep Tight bed, the rooms are classified as follows: 10 Beach Junior Suites, 19 Family Suites, 27 Pool Junior Suites, 82 Junior Suites, 4 Lagoon Suites, 5 Honeymoon Suites and 1 Maharajah Suite. This 5* hotel in Mauritius is sheltered by Le Morne Brabant peak - a breathtaking UNESCO World Heritage Site. Delightfully landscaped gardens, four pools, a spa and a selection of restaurants and bars offering delicious New World wines and island-inspired dishes add to the hotel's enchanting Mauritius ambience. Hotel accommodation: Every room of LUX* Le Morne is designed for the utmost in simplicity and comfort and are classified as follows: 64 Superior Rooms, 15 Honeymoon Suites, 10 Classic Junior Suites, 15 Ocean Junior Suites and 45 Junior Suite Prestige. Overlooking the beautiful bay of Grand Baie and turquoise waters, a panoramic view of the ocean made part of this site. This 5 * Luxury Boutique Hotel & Spa Baystone displays a very modern look and sleek playing the tones and clear for which all the furniture was custom made. Hotel accommodation: Enjoy extreme comfort suites which are classified in 2 main categories; Suites with views (including a terrace offering stunning views of the sea) and Sky Suites (flirt with the sky and enjoy as much space inside and outside).